Why stop the steady stream of screenshots now – here is another round from one of the most cherished events; the Moonrise. Leaflets are pinned to some houses of Stormwinds various districts and woodlands. Approaching one of the announcements, it is visible that the text is held both in Common as well as in Darnassian. “Ishnu’Alah, Kal’Dorei brethren and friends and citizens of Stormwind! 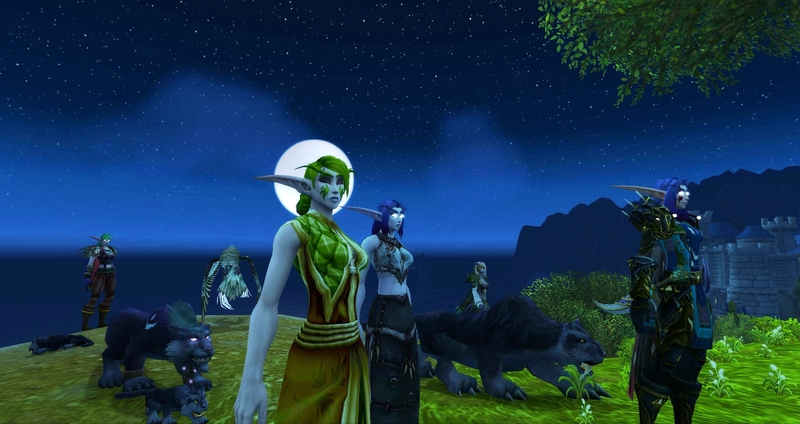 Back in the past years, the Nightelves of Kalimdor have invited your allies and kinsman alike to join the old Kal’Dorei custom of the monthly Moonrise, to share your friendship and your praises to Elune. In the light of recent events, your homelands became contested, with many of you finding refuge here on the other side of the world, which was surely no easy choice for you. Now we invite you to continue your custom, here in Stormwind, in the circle of your friends and allies. Your homelands may be far away and troubled these days, but we are all gazing upon the same moon. Be welcome to join us on the 1st sunday of this month, and every month, by the old grove above Stormwind Harbour, to share an evening of kinship and reminisce. There will be food and drink, and Cherwina will hold the prayer when it is time to receive the Goodnesses blessing. The festivities will commence an hour before Moonrise, and everyone is welcome! Leave your grudges and your weapons behind, and enjoy with us a peaceful celebration of Elune, of kinship and of the beauty of the rising moon. Phfew, I got through all 200+ I had taken. Thank you so much for the wonderful event! So many lovely images! I particularly like the second large one (the kneeling priest(?) in the Darkshore set), the fifth large one (the moon just above the horizon), and the last two where you’ve composited in actual cloudy night sky photographs. You have the cloth Wind Serpent robe from Sunken Temple! Its colors are so perfectly Druidy — I farmed that as RP clothes for my Druid, too. I also see that you’ve gone back to the bright eyes. Thank you, sweet Kam 🙂 Yes, me too, it looks so beautiful and serene when male Night Elves kneel! 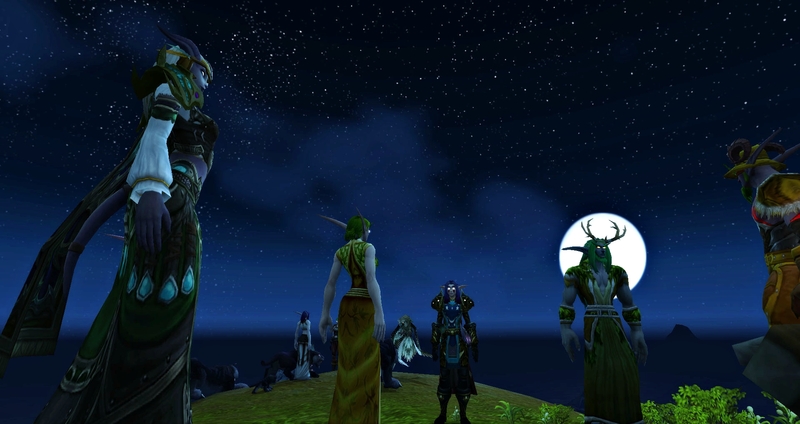 It´s weird; female Night Elves do have not their eyes closed when they kneel. Thank you for noticing; blending in the cloudy night real photo into the screenshot was no easy task. My goodness, it took very long, hah. I do, I do! I was so fortunate, when I ran Sunken Temple – I was so surprised to see it land in my inventory, when I got it! It´s gorgeous in detail – quite rare for Vanilla items, isn´t that so? What is it about the dark eyes that makes them just not work for roleplay? Ah, that makes sense. Thanks for clarifying! 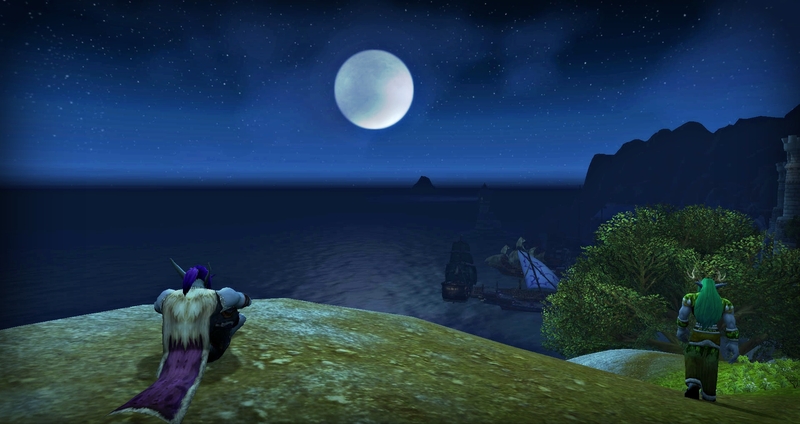 Thats a good spot for some night elf rp! I don’t even remember the last time I was in that area actually. I really like the progress of time you can see the day grow dark and the moon rising. 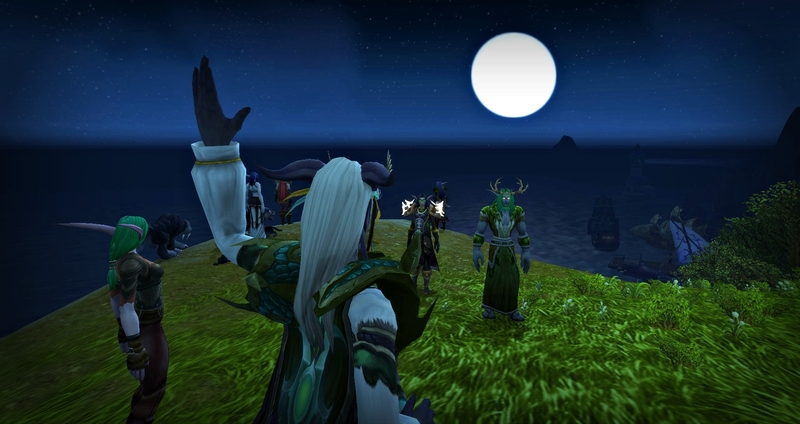 I really love that shot near the end of the elf looking over the water with the moon low in the sky. I really cherished it, it was a wonderful event. Yes, me too, that one turned out gorgeous 🙂 Thank you, Grimgrog – it was nice to be able to see it; the darkness of the night in Stormwind is always so beautiful. I do believe, that the nights in the game went darker in Legion, actually. They did use to be very dark in Classic though! That sounds amazing. Darker nights is something I would love to have. I’ll have to try classic out and see those nights also then. Yeah I am curious to see how it will play out in Classic too. I remember Duskwood, it was beyond dark!